I’ve been fortunate to have two successful professional careers: flying and real estate. My passion growing up in Des Moines, Iowa was flying, and I earned my private pilot’s license before I completed high school. After graduating from the US Naval Academy in 1978, I entered Navy flight training at Naval Air Station (NAS) Pensacola. I bought my first waterfront property in 1979 and met my future wife, Leslie Haynes, also a Naval Aviator while we were in Pensacola. Moving six times during our 38 years of marriage we built and/or bought a home at each location. Leaving active duty in 1985 we both entered the Naval Air Reserves at NAS Dallas, TX, which allowed us to continue our military flying careers until retirement in the mid-90s. I had been hired by Delta Air Lines in 1985 and Leslie was hired by United Airlines in 1989, so we called Texas home for almost 15 years while our airline careers and family grew. We moved to Atlanta, Georgia, in 1999, where I flew my last six years as an International Captain. However, 9/11 was hard on the airline industry and many airlines were going bankrupt. I took classes and started my real estate career obtaining my Georgia real estate license in 2004 working for Harry Norman Realtors. I took early retirement in 2005 when Delta declared bankruptcy and we moved to Grayton Beach, FL. I obtained my Florida Real Estate License in late 2005 and my Brokers license in 2014. Being a Realtor was hard in 2006-2010 due to the banking debacle. 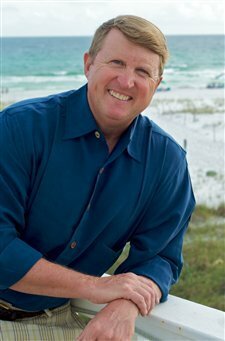 However, since then I have consistently been in the top 5 % of all Realtors selling in the Emerald Coast Association of Realtors and have served on their Board of Directors for four years. I also served on two International Real Estate Committees for the Florida Association of Realtors and continue to leverage my international experience and contacts from flying overseas. I am blessed to have been well travelled both in the Navy and with Delta Air Lines and it is my opinion you will not find more beautiful beaches anywhere in the world than right here along the beaches of 30A! Leslie introduced me to Grayton Beach back in 1979 and we bought our current property in 1993. We live full time in Grayton Beach, have three grown children and a rescue Boston Terrier named, Billy Bob. Leslie is still flying as an International Captain for United Airlines on the Boeing 787 Dreamliner! When not helping clients with their real estate needs, I can be found taking people out fishing aboard my charter boat named “The Tailhooker” in honor of our Navy carrier aviation careers. It was an honor to serve in the United States Navy and it would be an honor to earn your business and share my passion for real estate with you.